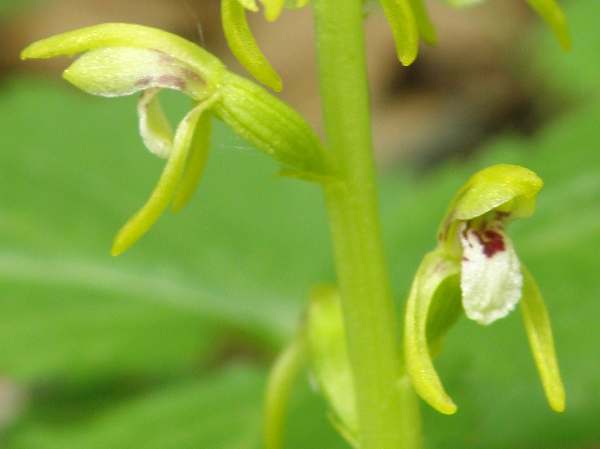 This orchid is now extremely rare in the UK... or is it just almost impossible to find it? It is one of those flowers that requires 'getting one's eye in' in order to find; in this respect it is rather like the Bog Orchid Hammarbya paludosa. The coralroot orchid is also very difficult to photograph, because it is so tiny (between 7cm and 30cm tall but usually nearer to the 7cm mark!) and it frequently occurs in very dark forest locations. The name coralroot refers to the roots of this plant, which are said to resemble coral - not that we have dug one up to prove the point. The plants of Coralroot Orchid are not always as colourful as the ones shown on this page. Where they occur in dark woodland and forests these little orchids are often fawn, and that makes them extremely hard to find among dense conifer needles on the forest floor. Although always growing close to trees, Coralroot Orchids sometimes occur in large numbers on the edges of paths and on roadside verges.The plant stems are brownish-green and the flowers have green sepals and petals with a paler lip sometimes marked with red. Despite being able to produce some chlorophyll (hence some plants are greenish, although many are purple-brown), this orchid is largely saprophytic, depending mainly for its food on the mycorrhizal fungi surrounding its roots. Coralroot is usually self-pollinating. One of the best chances of finding this rare orchid in the UK is to make a visit to Sandscale Haws National Nature Reserve, in the Lake District. Corallorhiza trifida can be found widely throughout Europe, and we have seen many of them flowering in Slovenia. It also occurs in North America in the Pacific Northwest, in particular. The specimens shown above and left were photographed in a forest in the Rhodopi Mountains of Bulgaria in mid June. In North America the common name for this species is Early Coralroot Orchid. This orchid occurs in a range of habitats from dark forests and tree-lined roadside verges to dune slacks and open tundra. 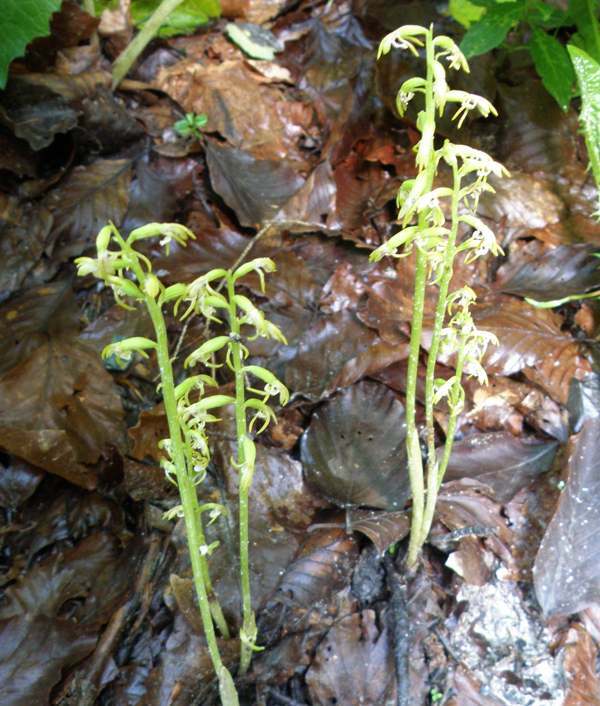 Coralroot Orchid flowers in June and July. 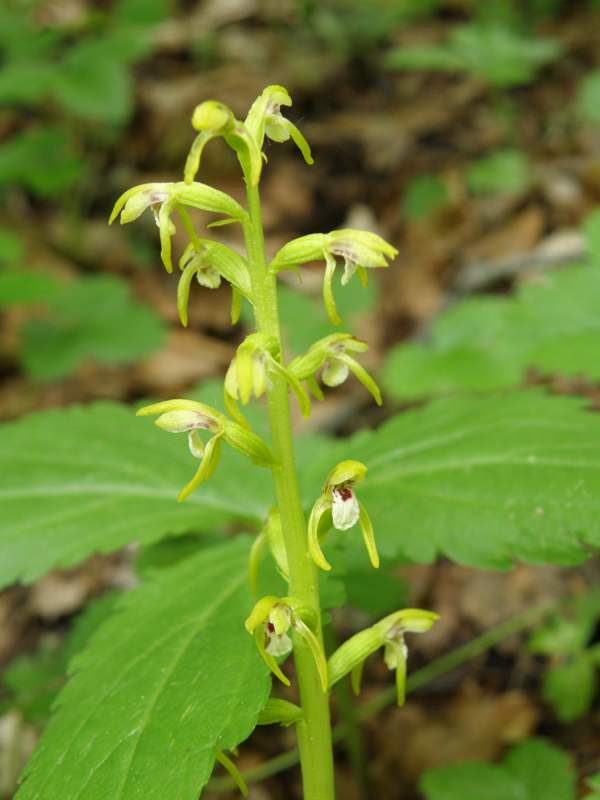 The Coralroot Orchids shown on this page were growing on a roadside verge in Slovenia.